Today we are talking about taking control and sharing with you a fabulous technique, taken from Stephen Covey’s book “The 7 habits of Highly Effective People“. If you haven’t read this book, we highly recommend it! When faced with obstacles, the ability to channel energy and focus on the things you have influence over will also increase your capacity in taking control and to bounce back. All too often, the range of hurdles can feel quite insurmountable, and it’s difficult to know where to start in making any kind of change. 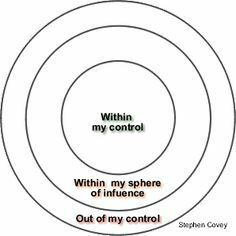 This little activity from Stephen Covey’s book is really meant to help you to differentiate between those things you might be able to alter, allowing you to put to one side anything you can’t control. Take a few minutes to write down any difficulties which you think are standing in the way of your career goals, and then draw two circles, one inside the other. On the inner one, copy from your list anything you think it might be possible to change, and write everything else in the outer circle. We all have some opportunity for control over our future, and playing an active part in forward planning will help you to build resilience, even when you feel faced with increasing obstacles. Consider your level of experience, your commitments, how you spend your time, your skills and so on. This approach doesn’t mean ignoring difficulties, but by reviewing them objectively, and using your problem-solving skills, you’ll find it easier to think about what you might be able to change. This might be immediate, in six months’ time, maybe even in a few years’ time. But knowing change is possible is the first step in moving forward. Try to set out some changes you could make in future within a short action plan.